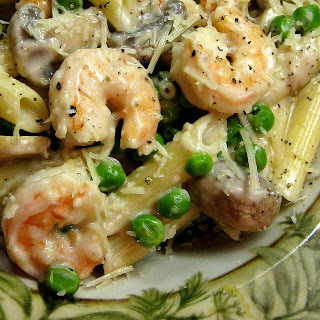 Cheesy cream sauce, shrimp, mushrooms and peas. What else could pasta want? Absolutely nothing. :) Enjoy! 1. In a large pot of salted boiling water, add penne and cook until al dente, about 10 minutes. Drain pasta and reserve. 2. Melt butter in a sauce pan. Add flour to the melted butter and cook for about 2 minutes. While whisking, add hot milk to the sauce pan and stir until the sauce thickens. Add the cheddar and stir until the cheese is melted into the sauce. Remove from heat. Season with salt and pepper to taste. 3. In another large skillet heat the olive oil over medium heat. When the oil is hot, add the garlic and shrimp and cook until the shrimp is pink. Remove the shrimp to a plate and keep warm. Add the mushrooms to the skillet and cook until browned. Add the shrimp, sauce and peas to the mushrooms. Stir to combine. 4. Add cooked pasta and stir to combine. Garnish with parmesan cheese. A delicious pasta dish! Nice combo! I want to have it, looks creamy delicious. It is lacking nothing, nothing else , it is perfect. So delicious. Im printing it out for my sister. She loves all your shrimp dishes!! Looks so creamy and delicious! I've been craving for creamy pasta lately...this looks perfect! Woww so creamy n delicious!! That looks SO good!! I wish my husband liked shrimp more. You had me at "creamy"... and "shrimp"! Love the white cheddar in this dish; lots of flavor! This looks wonderful but I adore shrimp. I like the combo of mushrooms and peas. I've got to try this one. Oh My Goodness! That looks delicious and can't wait to try it. Amazing photo! This recipe would be great with several different varieties of fresh mushrooms. I think I will try it with a mixture of oysters and shiitakes. I find that oysters have a nice velvety texture that compliments creamy sauces very well, and the shiitake will boost up the mushroom flavour. Thanks for the inspiration! Oh, my, that looks delicious! That shrimp pasta looks tasty! Well, I know what I'm having for dinner. This is low fat, right?